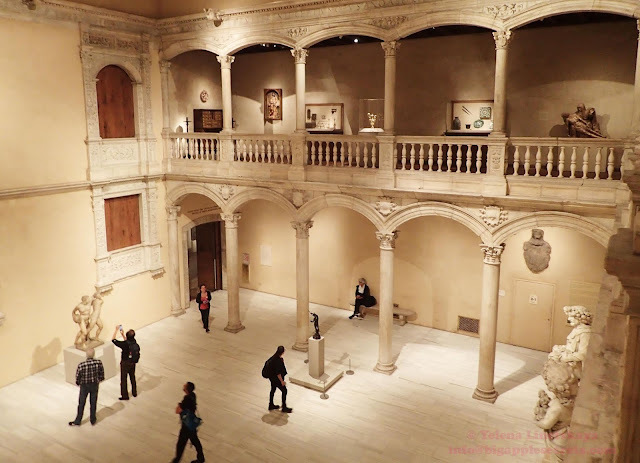 New York: Picture of the Day : Patio from the Castle of Vélez Blanco (1506–15) in Metropolitan museum of art . It was originally part of the Castillo de Vélez-Blanco in , Andalusia, in the southeast of Spain . In 1904, the castle's owners sold the entire patio to a Parisian dealer. George Blumenthal purchased the patio in 1913 and gifted the patio to the Metropolitan Museum of Art on the year of his death (1941). Patio from the Castle of Vélez Blanco (1506–15) in Metropolitan museum of art . It was originally part of the Castillo de Vélez-Blanco in , Andalusia, in the southeast of Spain . In 1904, the castle's owners sold the entire patio to a Parisian dealer. George Blumenthal purchased the patio in 1913 and gifted the patio to the Metropolitan Museum of Art on the year of his death (1941).